Japansese tattoos are unique as they signify their rich culture and history. These nuances in western tattoos are really hard to find. Plus there is the question of picking a unique design you always will! 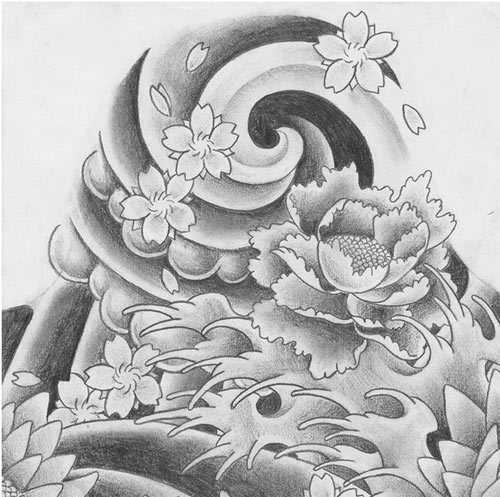 A Japanese tattoo art is something you will be proud to display. 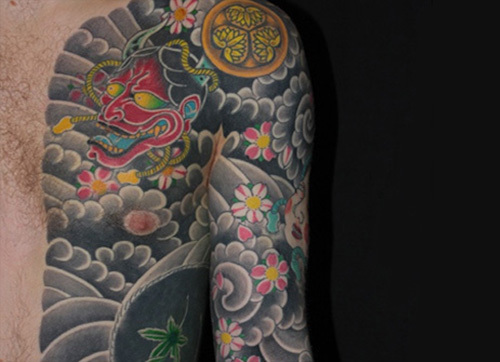 Japanese tattoos are also called Irezumi. They are artistic, with rich vibrant colors that display their oriental heritage and roots. They are varied in patterns, shapes and sizes and range from a variety of paintings and calligraphy. The palette is mostly based in black or red. This is a beautiful tattoo showing two Japanese storks depicted in the traditional way. One stork rests on the ground while the other swoops down towards it from a height. The storks are outlined in black, highlighted with blue ink for the feathers and yellow for textures, and the head is painted red. This tattoo depicts a geisha in silk robes, a popular image of Japanese culture. The geisha is shown in rich maroon robes that are bordered with gold on the edges, with a gold rope that ties at her waist. She is wearing a matching headdress in maroon and gold, and in standing against a large blue lotus flower. Black and white storm clouds are outlined behind her head. 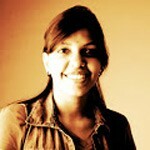 The expression on her face is one of surprise and inquisition. 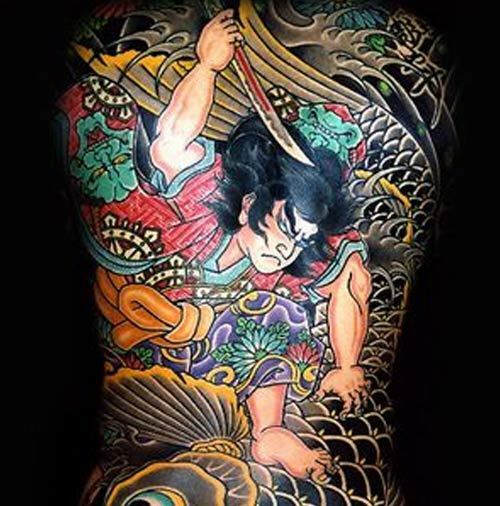 This tattoo depicts a samurai warrior, a figure that is at the very heart of Japanese culture. The samurai is seen in red robes bordered on the edges with green embroidery, tied at the waist with a gold rope. He is clutching a sword which has bloodstains on it and he is seen to be plunging it into something. He looks enraged, with his dark hair flying. He is riding a giant fish whose silhouette can be made out dimly. The fish, or pisces, is at the very heart of Japanese symbolism, along with the pink lotus. They are recurrent images in Japanese art. 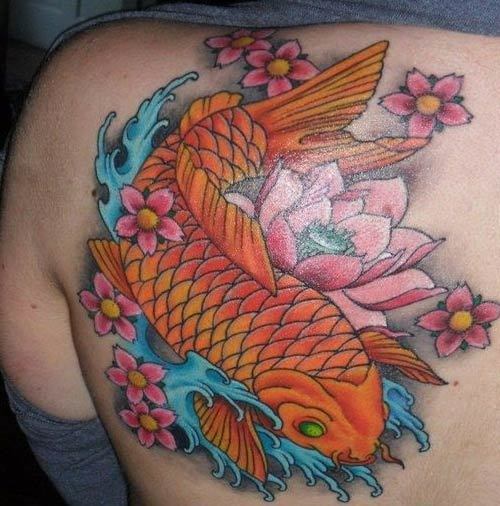 This tattoo depicts a large scaly fish, painted in orange, moving swiftly over sky blue little waves, over a bed of pink daisies. A large pink lotus flanks it on one side. 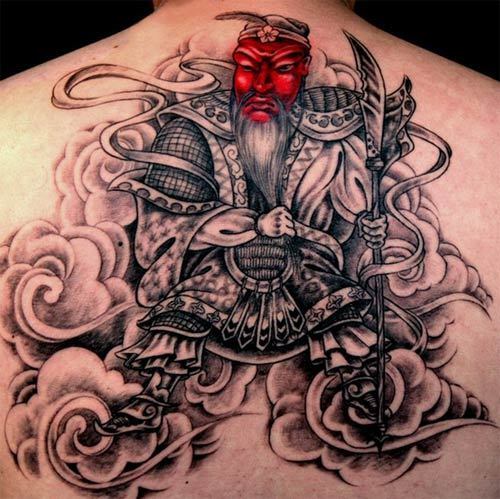 This tattoo depicts an ancient wizard samurai, sitting in an alert posture. The tattoo is black and white except for the samurai face, which is painted red for contrast. The samurai is old, with a long white beard like most wizards. He is wearing armour and carries a spear. He is surrounded by angry gray clouds. Bamboo is the most common image associated with Japanese art. This tattoo is black and white. 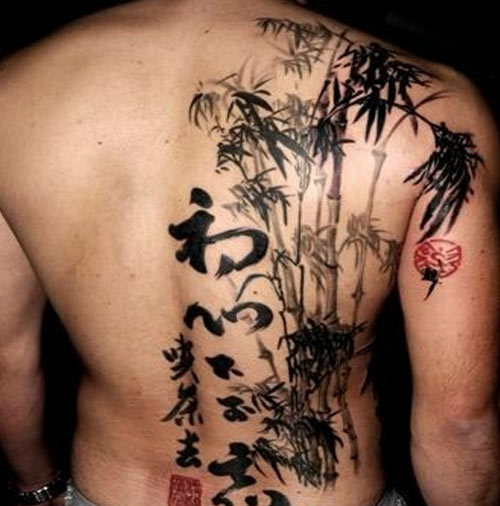 It depicts a bamboo bush, and Japanese characters are written as calligraphy on the side. Some red characters are found at the side for contrast. This tattoo is in black and white with gray shading. It depicts a stormy sea, with waves in ringlets, and large lotuses floating on it, accompanied by daisies and other small flowers. The tattoo is artistic and dainty. 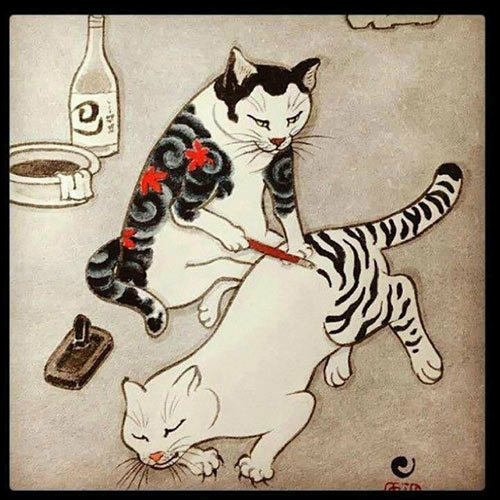 The Japanese obsession with cats is well-known, so a tattoo is only to be expected on them. This is a funny tattoo that shows a cat with black coat decorated with fancy red flowers, holding a paintbrush while a white cat lies at his feet. The first cat is using the brush to paint black tiger stripes onto the second cat that is white. 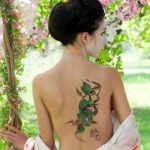 This tattoo is traditional and oriental. It shows a dragon with yellow demon eyes and a blue tongue, with a yellow noose around its neck. The background is composed of black and white abstract designs. This tattoo is black and white with a red background. 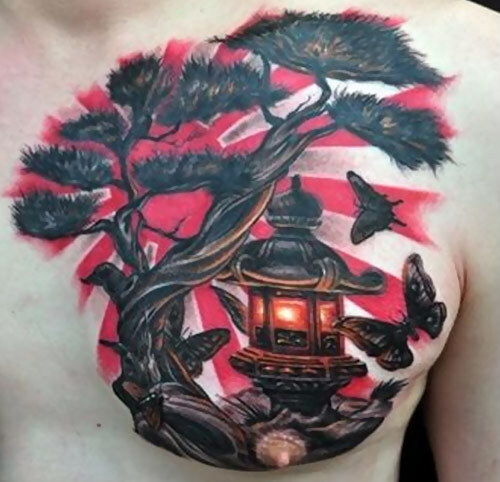 It shows an ancient lantern on the branch of a tree, whose light attracts the butterflies and paints the sky red. Clearly if you are looking for inspiration from ancient history, this genre is what you should pick! Which one has become your favorite? Do leave us a comment!